The global and regional environment in which the Asia-Europe Meeting (ASEM) operates has changed significantly since its inception in 1996. Financial crises, terrorism, climate change, and pandemics have emerged as global threats that compound the insecurity and challenges facing an increasingly inter-dependent but fractious world. More than ever, the need for more effective Asia-Europe dialogue and genuine cooperation is urgent. What should be ASEM’s priorities for the next two years? What are the most pressing concerns shared by governments and civil societies in Asia and Europe, especially those concerns that could benefit from concerted policy attention and sustained ground action from citizens? CCS4 took stock of and analysed some of the current trends and issues that define the Asia-Europe dialogue to date, identified the most constructive areas for civil society cooperation, and forecast emerging issues that could have an impact on future ASEM dialogue and directions. The conference brought together an unconventional mix of participants from ASEM governments and civil societies to work collaboratively on a focused report to ASEM leaders at the Brussels Summit. The two-day conference facilitated seven concurrent thematic workshops and one panel discussion on the topic “Views from the ASEM Community”. The workshops and the panel were connected by an opening and a closing plenary, which featured keynote addresses by ASEM leaders and eminent personalities. In October 2010, the Asia-Europe Foundation conducted the 4th Connecting Civil Societies of Asia and Europe (CCS4) Conference. 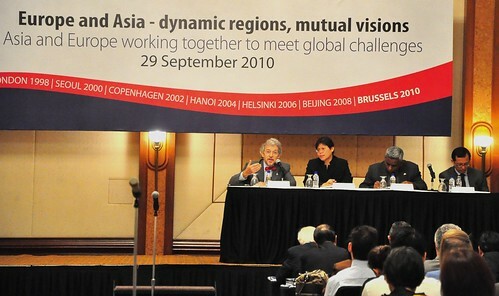 The conference was an official side event of the 8th Asia-Europe Meeting (ASEM8) Summit, held in Brussels from 4-5 October 2010. A number of international newspapers have reported on ASEF's activities during the ASEM8 Summit. Ng Jing Yng of Today (Singapore) reported on two workshops from the CCS4 Conference: "Who should pay for higher education?" and "Access to Information". Ms Ng stated that as costs for higher education increase, it is still the government's role to ensure that funds are used efficiently. In her second article, Ms Ng highlighted that having access to public information was key to an efficient administration, instilling trust in decision makers and promoting economic growth. Mr Xavier Batalla of Spanish daily La Vanguardia, who participated in the 5th Asia-Europe Editors' Roundtable, wrote about how Europeans are fascinated by Asian growth, and how the Chinese are convinced by the gradual decline of the West. He also wrote how China forsees a world without a global power center. Ms Yuli Ismartono of Tempo (Indonesia) stressed how exchanges such as the Editors' Roundtable have become more relevant as more complex issues surface because of globalisation. She also expressed her appreciation for the exhibition "A Passage to Asia", which she lauded as "a result of ASEF's hard work at forming the Asia-Europe Museum Network (ASEMUS)." The exhibition was supported in part by ASEF. Read more media clippings from the 4th Connecting Civil Societies of Asia and Europe here. The 4th Connecting Civil Societies (CCS) Conference “Changing Challenges, New Ideas” took place in Brussels on 1-3 October 2010. An official side event of the 8th Summit of Leaders of the Asia-Europe Meeting (ASEM8), CCS4 was a platform for civil society to convey recommendations to the leaders of 46 Asian and European countries plus the European Commission and the ASEAN Secretariat, who met in Brussels on 4 and 5 October. Concluding with eight points of action for ASEM leaders to enhance Asia-Europe cooperation, CCS participants welcomed the continuing political dialogue between ASEM leaders at the highest level, and called for greater civil society engagement and partnership at all levels and initiatives of the ASEM process. These recommendations included moves for advancing interregional and regional integration; mobilising resources for higher education; harnessing voluntary service for lifelong learning; building regional communities for post-conflict reconciliation; guaranteeing access to information; promoting public health through “young” ideas; and applying the arts in sustainable urban development. Senior editors from Asia and Europe also concluded a roundtable discussion by noting an urgent need for Asia and Europe to learn from each other as challenges and risks are increasingly inter-connected across borders as well as across sectors. The “Eight points for ASEM8” recommendations of the 4th Connecting Civil Societies of Asia and Europe Conference were channelled to the Leaders attending the 8th Asia-Europe Meeting. (Click here for the full report).